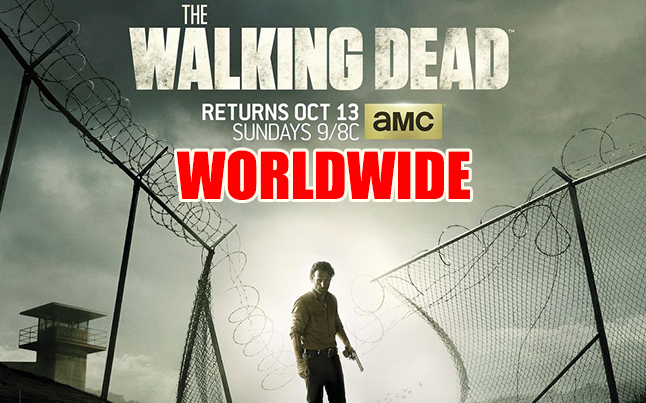 The Walking Dead Premiere Airing Worldwide Within 24 Hours Of U.S. The Walking Dead Season 4 premiere will be airing worldwide within 24 hours of the U.S. showing, which translates into a 125 countries able to watch nearly at the same time. This is a first time they have done this, and it probably should have been done long ago. Normally, the U.S. is about 1 week ahead of the rest of the world, but not this year. Fox channels around the globe will air the premiere within 1 day of the U.S., which helps to cut down on spoilers ruining it for the rest of the international fans. The biggest problem is of course the spoilers. The U.S. being about a week ahead of the rest of the world made it nearly impossible for fans to avoid spoilers. I mean with Facebook, Twitter, Google Plus, and any other social media you can think of, avoiding spoilers is difficult. Especially if you are a week behind. Finally, not only will the season 4 premiere be airing worldwide within 24 hours, but so will the rest of season 4. The fact they are able to do this, is actually a big accomplishment. They have to actually translate, or dub, the episode into 44 languages to make it happen. So what could be next? Maybe next year fans from the U.S. and the rest of the world could watch nearly at the same time. There will always be issues of time zones, since when it airs in the U.S. there are places where the rest of the world is sleeping. However, cutting it down to say a 12 hours difference might be reachable. The Walking Dead season 4 begins again this Sunday, October 13th, and fans both in the U.S., and worldwide, are dying to watch their favorite show again.